Your hibiscus makes a delightful image. Thank you for sharing. LOL the link on my name goes to a very, very old post. Here is the correct one for my Todays flower. I admire your composition. The bright flower color and green leaves against a neutral background is striking. Thanks for sharing your photo. A beautiful picture of a lovely hibiscus. Composition and colour makes a great shot. Hibiscus! I grew up with red ones in Indonesia and now, in Holland I have blue ones in my garden. love the red color. mine is pink. 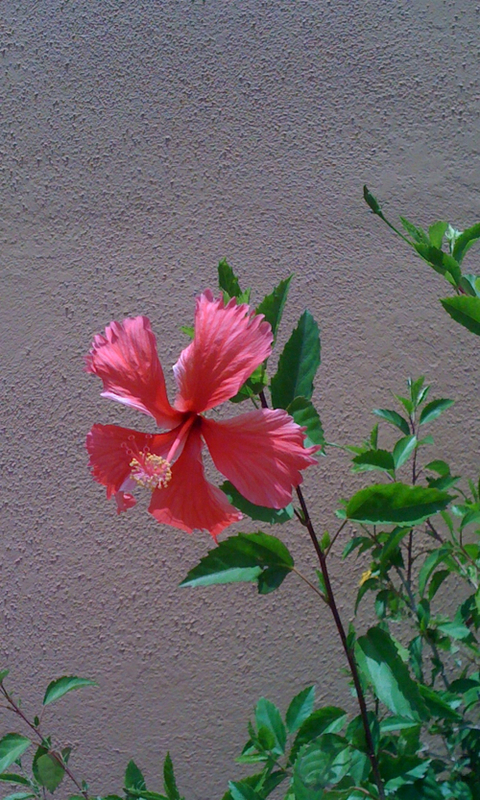 i miss hibiscus flowers back home in my country philippines. Beautiful photo, the Hybiscus leaps right out of the picture at you.